Engineered to meet your high-security application needs, the ZXP Series 9 � lets you produce photo-quality cards quickly and reliably. Higher image quality with vibrant, rich colors. The ability to print on uneven card surfaces such as smart cards. The ability to print on non-PVC cards. Direct-to-card printers require a dye-receiving surface, which is not available on all non-PVC cards. More durable and abrasion-resistant cards that don�t require an additional overlay or varnish. Built-in fraud protection with inherently tamper-evident film. Extending Zebra�s line of card printers, the ZXP Series 9� is a retransfer card printer specifically engineered for high-security applications. With industry-leading throughput�up to 190 cards per hour�it enables you to print more cards faster and with outstanding quality. Take control with the printer�s user-selectable print quality mode, allowing you to optimize for print speed or sharpen print quality. And, the dual-sided, simultaneous retransfer process provides best-in-class printing, encoding and laminating throughput. Featuring Zebra�s patented waste-free laminate design, the ZXP Series 9 provides an extremely low cost-per-card and eliminates more than 50% of the typical waste. WHAT ARE THE MAIN SPECIFICATIONS OF THE ZEBRA ZXP Series 9 ID CARD PRINTER? WHICH LAMINATES ARE AVAILABLE FOR THE ZEBRA ZXP Series 9 ID CARD PRINTER? The Zebra ZXP Series 9 ID card printer is designed to work with Zebra True Secure i Series laminates. Easy to load and ultra-secure, these secure varnish overlays and laminates are particularly effective to fight against card counterfeiting, alteration and duplication. Clear laminates: a clear protective layer of 1.0 mil is applied to your printed cards to protect them from wear and tear. Top and bottom laminates are available in rolls of 625 imprints. 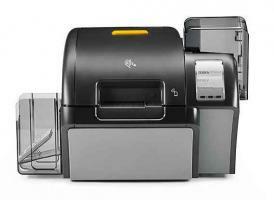 WHICH OPTIONAL FEATURES CAN I ADD TO MY ZEBRA ZXP Series 9 ID CARD PRINTER?